Did you enjoy the post about creating a beautiful color scheme you love? Great! Then you now know exactly how to find the right colors for a crafting project. 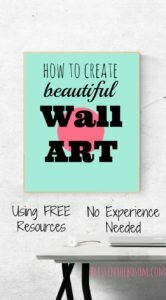 Would you like to know how to make a nice printable and create wall art, too? With no previous experience needed! Let’s make it happen. Grab your palette, pen, and paper. If you don’t have any experience in graphic design, no worries. The software we will be using is super easy to navigate. You have the color palette ready to use and your idea in mind. This is all you need to create wall art or a printable. For this tutorial, we will be using PicMonkey. The free printable I shared on this post is going to be my example. PicMonkey has no longer a free option to create and download designs! You can use this tutorial anyway with a still free online tool like Fotojet and choose “Design”! Open your color palette. Draw a quick draft of what you want to design on paper. Put it on a wall and step back. I usually skip those steps… just to regret it later! For example, I didn’t save the color palette I used and now had to do it all over again to get started. So take a minute to think about what and for whom you want to create. 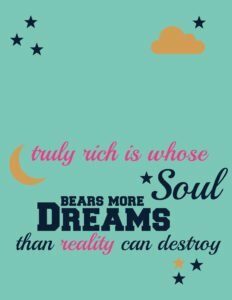 Also, it might be a good idea to note what fonts, templates, etc., you are using while creating your printable wall art for later reference. Navigate to the PicMonkey where you will find this selection at the top. 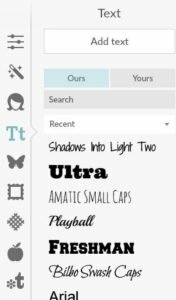 Now choose “Blank canvas” if you want to create a smaller piece like a card or “Custom size” if you want to create something that is printed in letter size or bigger. To create wall art this is the way to go. So, in this guide, we will choose “Custom size” and then give the size of 3400 x 4400 pixels. This is close to the largest size you can use in Picmonkey’s design editor and will give you a poster format. You will end up with an image of about 15 MegaPixel. This can be printed up to 11×14 inches (or A3 format) in high quality and should still be ok up to 24×36 inches. Check out this conversion chart at Picmonkey for choosing the right size for your image. Ok. Now you have a blank custom size canvas to start with. To keep it simple we will be making a printable piece of art using what you will find in Picmonkey for free. 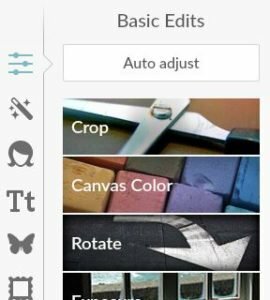 If you want more customized wall art you can easily upload backgrounds, fonts, or overlays from your computer, too. Or you go with the Picmonkey premium templates and features. 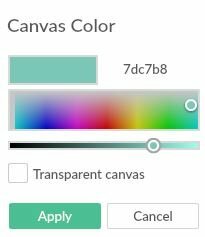 First, choose a background color for your canvas by clicking “Canvas Color” on the left of your screen. In my example, I go with a bright and rather light color: sea-green, hexcode 7DC7B8. Copy and paste your background color’s hex code into the field (where it says ffffff, aka white, per default) or use the color board to set the background color manually. If you are happy with the color, hit apply. Choose “transparent canvas” to make the background disappear, for example, to create a logo or lettering only. By default, your canvas is aligned horizontal. If you want it to be vertical (like my example) click on “Rotate“, hit the circle arrow, and press “apply” to save. Voila, there is your background. I didn’t use any template. Hit “add text” for every new line or any word you want to emphasize. That way you can change font size, or move around each line/word individually. In my design, I’m using five different pieces of text. To change your letterings’ size you can drag the text field corner or use the text options box. This is also where you change the color, alignment, or other text features. Once you are happy with your text you can start decorating the piece. With the “textures” button (looks like a little grid) you can add fancy effects to your background. Go and play around with it. As long as you don’t hit “apply” you can always go back to your background by clicking “cancel”. I didn’t use any of the textures in the example. I used “Overlays” that hide behind the butterfly button. Here you will find the most common things to put on your canvas. I used a star first. I made it small and dark blue as the text and then duplicated it by right-clicking and choosing “duplicate overlay”. (Copy and paste works, too) Then I spreaded the stars over the canvas and finally made one of them golden yellow. Also, I added a cloud and a moon in that accent color. You will find the cloud in the “symbols” subsection. I didn’t find a half moon so I used two circles (section geometrics). One of them has the same color as the background and hides part of the yellow circle so it looks like a crescent. There are lots of overlays and other options to pimp your piece. Take a minute to go through them. Also, check out the effects you can add. (Magic wand button) The apple button shows a selection of themed effects and overlays. Make sure not to clutter the piece. When in doubt, step back from your screen and take a look. Chances are, you already have too much going on. Also, do not mix too many fonts, colors, or overlays and keep some free space. Guess what? One of the most re-pinned art crafts on my Pinterest boards is a simple pink canvas with two words on it. Look here for this popular “Choose joy” printable. Anyway, if you want to break these rules, go ahead! It’s your project, your rules. Right in Picmonkey, you have a storage for your works and you can go work on them later! You can save or download (“export”) your canvas and all layers are being merged then. That means you can not open it in Picmonkey again and change things. For later changes, you use the file that is saved in Picmonkey. Once you are happy with the outcome, hit “save”, then give a name for your masterpiece, choose “jpeg” and a destination (your computer, dropbox account or onedrive). Download. An alternative to Picmonkey is Canva. 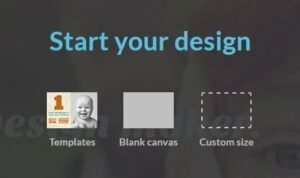 Canva.com comes with a basic free version, lots of free templates to use and a lot free overlays. And with Canva you can go back to your project and work on it even if you use the free version. 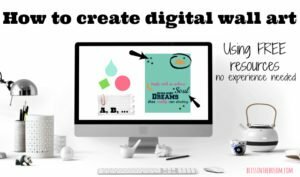 And you can even create ebooks in Canva. However, you have to signup (for free) if you want to use Canva and you can’t upload your own fonts. 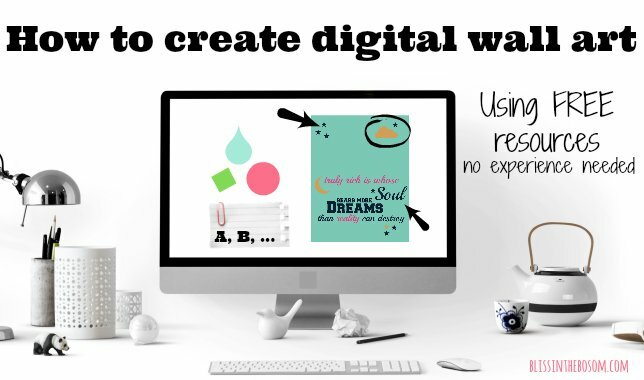 So, now you master crafting a digital piece of art and you know how to create wall art that rocks. What is your first project to tackle? Maybe a organizer desktop wallpaper (learn how here!)? Would you like to share your art as a printable on your blog? Then stay tuned for the next post about how to give away printable wall art on your blog and track downloads. And for now, have fun crafting!